(CNN) -- Former Inter Milan striker Adriano has returned to Brazilian football, after Flamengo confirmed on their official Web site that the 27-year-old had signed a contract with the club. Adriano has signed a contract with first club Flamengo following his release from Inter Milan. Adriano scored 74 goals in eight years with Inter -- winning three league titles and two Italian Cups -- but was released from his contract with the Serie A champions after returning home saying he needed a rest and citing depression. Adriano joined Inter in 2001 and, despite loan spells at Fiorentina, Parma and Sao Paulo, only officially moved on when his contract was terminated last month. Flamengo's offfical Web site confirmed Adriano will start training on May 18 after first resolving outstanding business matters in Italy. 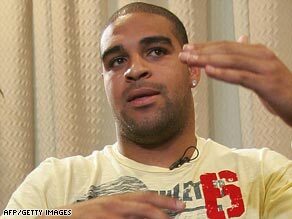 The transfer sees Adriano return to his first club, where he made headlines as a young professional before leaving for Italy in 2001.